Contemporary interdisciplinary artist Crystal Wagner will present a lecture and create a large installation with students as part of her residency in the College of Visual and Performing Arts’ Department of Art Feb. 23-26. As a guest of the Department of Art’s printmaking program, Wagner is working with students to create an installation in the atrium of Comstock Art Facility, 1075 Comstock Ave., beginning on Monday, Feb. 23. Wagner and the students will work on the installation for 10 to 14 hours each day until it is completed on Thursday, Feb. 26. The University community is invited to observe the installation work during regular building hours, 9 a.m.-9 p.m.
Wagner will also deliver a lecture on Tuesday, Feb. 24, at 6:30 p.m. in Shemin Auditorium of the Dorothea Ilgen Shaffer Art Building. The talk is free and open to the University community. Wagner’s interest in combining two- and three-dimensional forms, alternative use of materials and hybrid approaches to printmaking and massive site-specific installations have led to her artwork being exhibited extensively in the U.S and abroad. 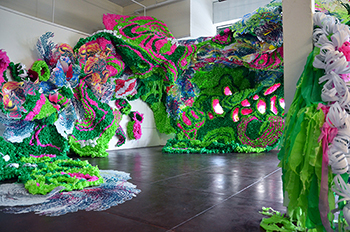 Her most recent commissions include a large-scale installation for the internationally recognized band the Flaming Lips and a large shadow box for GNU, a snowboard company. She actively visits universities across the U.S as a visiting artist. Wagner received a master of fine arts degree from the University of Tennessee, a bachelor of fine arts degree from the Atlanta College of Art and an associate in fine arts degree from Keystone College. She is represented by Hashimoto Contemporary in San Francisco. Learn more at http://www.crystalwagner.com. For more information about the installation and the talk, contact Dusty Herbig, associate professor of printmaking, at dtherbig@syr.edu.